Calgary, AB – December 5, 2018 – UFCW Local 401 members in Calgary took action today in support of Co-op workers in Saskatoon. 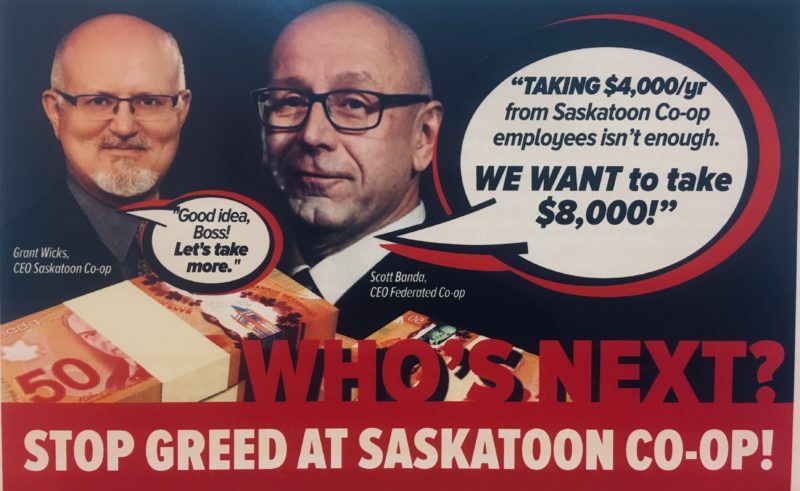 Handing out leaflets and free grocery bags, UFCW members asked customers to speak up and send a message to Saskatoon Co-op CEO, Grant Wilks, under whose direction the company has pursued an agenda of wage cuts and disparities among Co-op employees. UFCW Local 1400 members working at Saskatoon Co-op were forced out on strike on November 1, 2018, by a greedy employer who wants to roll back the principles of the cooperative movement – principles like fairness and pay equity. Saskatoon Co-op has taken a hardline in negotiations with Local 1400, demanding that full-time employees earn up to $7,900 less per year for doing the same job. They also want new workers to be on a lesser pay scale altogether. Meanwhile, Federated Co-op’s senior managers and directors share nearly $10-million a year. Saskatoon Co-op employees are fighting back. For more information on the Saskatoon Co-op strike, visit www.ufcw.ca/saskatooncoop. As Alberta’s largest private sector union, UFCW Local 401 proudly represents grocery workers across the province, including Co-op employees at locations in Edmonton, Red Deer, Medicine Hat, and Taber, Alberta.